Essential amino acid and precursor of serotonin, melatonin and niacin. After nearly 15 years' absence in Europe, L-tryptophan, one of the essential amino acids in the diet, is back - available once more in an authorised nutritional supplement. In 1990, its use in supplements was banned, after a single contaminated batch of tryptophan supplied by one Japanese manufacturer apparently led to the development of a deadly condition. Its use in drugs, infant formulas and parenteral food products, however, continued unhindered. It should be noted that this ban coincided with the launch of Prozac. A precursor of serotonin, melatonin and niacin, tryptophan is a vitally important substance. Discovered in 1901, it has been used for decades to relieve depression, promote sleep or aid weight loss. Other ingredients: microcrystalline cellulose, fructooligosaccharose, magnesium stearate. Each tablet contains 500 mg of L-tryptophan, one of 8 essential amino acids present in the diet. Tryptophan is a precursor of serotonin, melatonin and niacin. Take one to two tablets a day. 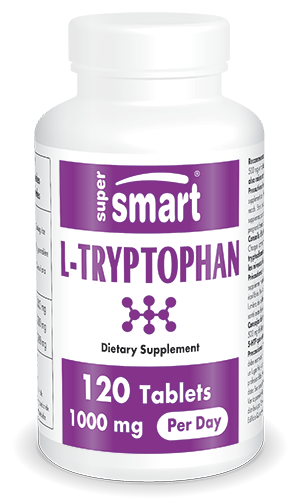 Do not take tryptophan alongside other substances such as 5-HTP which also increases serotonin levels, without medical supervision.